Today we counted 93 eagles with the efforts of 36 hours of people out counting throughout the Lower Wisconsin River environs (Table 1). This total is 11 eagles fewer than two weeks ago. As with the first count, most of our eagles used either the Ferry Bluff Roost or Lone Rock Roost which is well down river (Figure 1). Sugarloaf Roost, however, had 13 birds using it during our second count, whereas few birds roosted there two weeks ago. The temperature at nightfall was also warm again which probably lead to undercounting birds, missing eagles that remained in the river valley for the night rather than flying to more traditional roosts where counters were located. This year, we are observing at 9 traditional roosts and one roost that was discovered last year near the dam. As of yet, we do not know if the roost at the dam is a traditional roost or a roost that is used during periods when high numbers of eagles are around. Over the years we have found many temporary roosts such as Devil’s Lake, Baxter’s Hollow, Isenring, Thunderbird, Schroeder, Cassell, McDonald and Big Hollow (Figure 1). Ultimately, we only can distinguish between a traditional roost and a temporary roost by observing roosts over time. Most of our traditional roosts have been used consistently each year for over a decade. Non-traditional roosts get used for only a year or two. Interestingly, amount of use by eagles within one year does not help us distinguish a traditional roost from a temporary one, as all the temporary roosts mentioned above had, at one time or another, over 20 eagles using the roost during at least one count. Our collective efforts this year will help us to understand night-time eagle use at the dam. 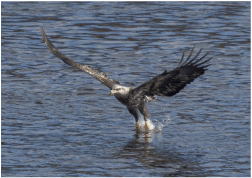 Besides being interesting to see what happens as the numbers of eagles that winter in the greater Sauk Prairie Area grow, data from the dam will be important is assessing impact to eagles from the Great Sauk Trail being planned. This trail will follow the current rail line that goes through Sauk City and Prairie du Sac. One question that FBEC needs to determine is how to assess the impact of winter and summer human use on this trail once it is constructed, and how we might guide development.